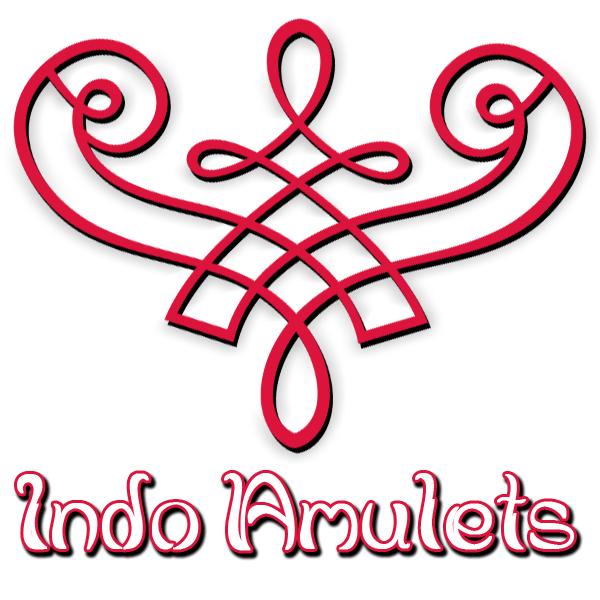 Kerises and other pusaka (heirloom) items made in thirteenth to fifteenth century Java during the glorious tangguh Majapahit era (1292–1500 CE) are among the best collections of traditional Indonesian weaponry. The royal artisans of the Javanese Hindu Kingdom of Majapahit brought forth some of the most amazing works of art and architecture. 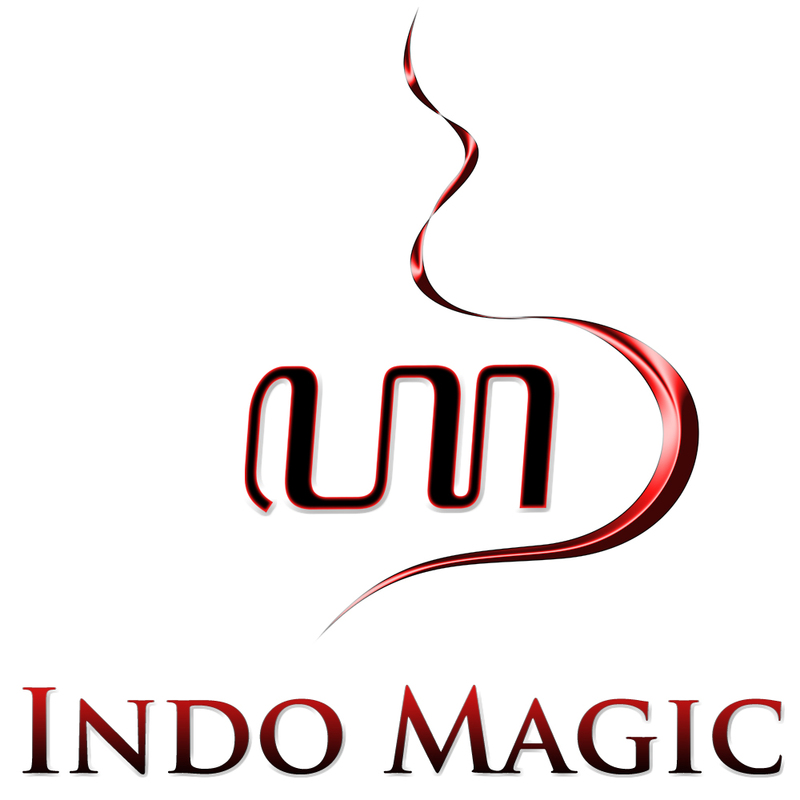 Thus, this historical period is considered the Golden Age of material art and culture in Indonesia. 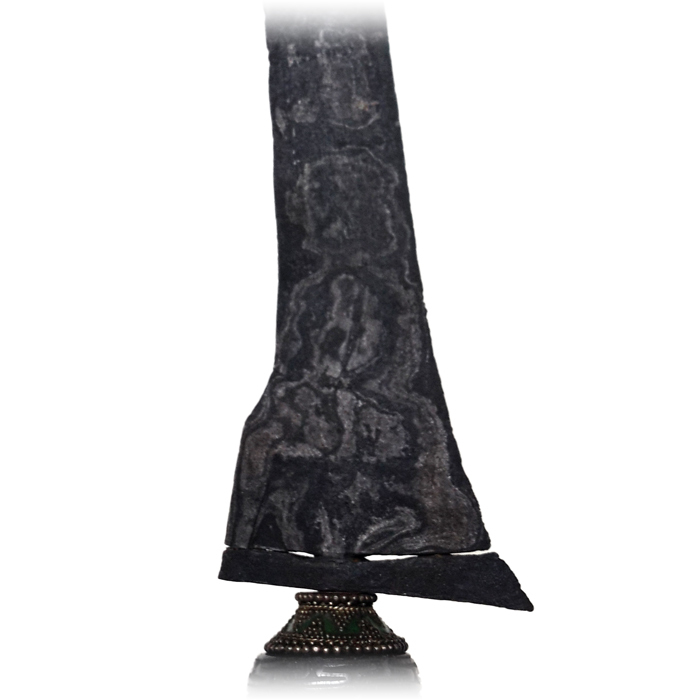 The majority of antique kerises from the Majapahit era is indeed of great finesse. And this charismatic keris is no exception; the ancient iron has been masterly forged into the classical straight-bladed Brojol dapur model. Its simple design should not be deemed as unsophisticated, for it represents a highly refined expression of artistic modesty. Especially the intricate pamor motif reveals the highest degree of craftsmanship, because besides the neatly arranged Benda Segada (or Bendo Segodo) pattern the pamor also includes a very impressive Raja Gundala (pronounced: ‘Rojo Gundolo’) feature (i.e. 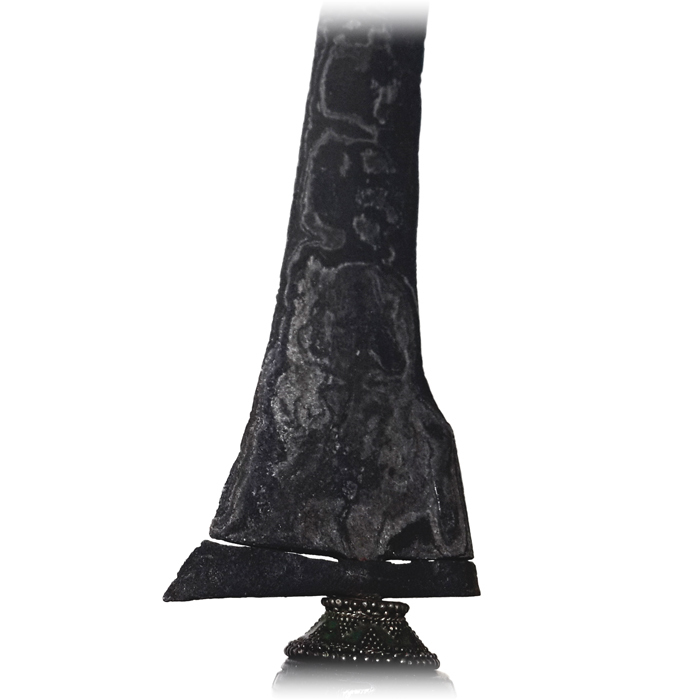 a mysterious image of a lady seated at the base of the blade). 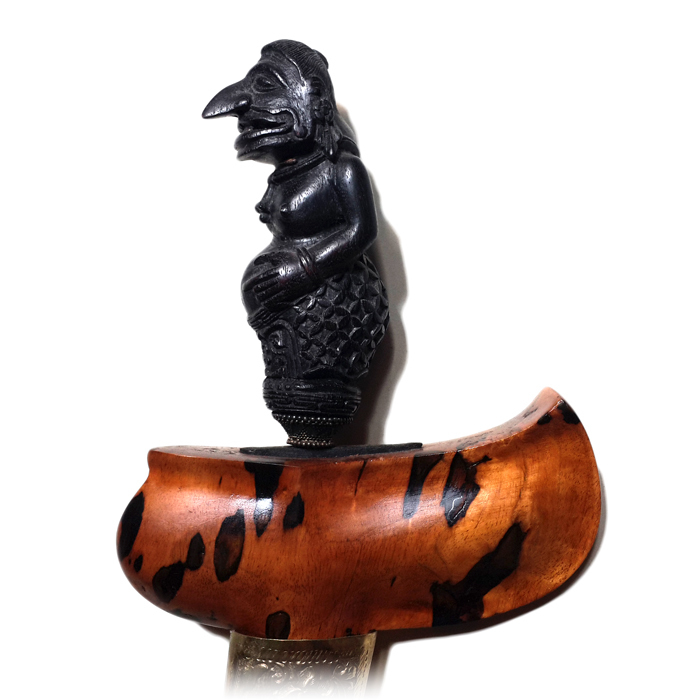 This pusaka comes with a hand-carved warangka (sheath) from high-quality Timaha wood, a special type of wood which is considered sacred by the Javanese. Also, the keris has a very special hulu (hilt) which is carved in the form of Petruk. Petruk is a wayang character in traditional Javanese shadow play. His personality is characterized by wisdom and nobility, though he also has a good sense of humor. 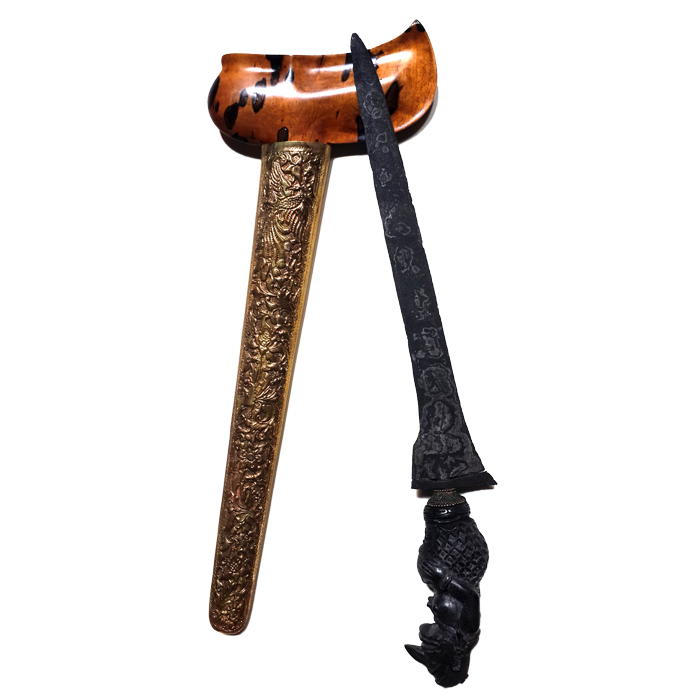 All in all, the charismatic keris Brojol with its spectacular pamor motif and sheath and hilt is endowed with virtues that will bring good luck, fortune, peace and harmony to the owner and his or her family.